Can you stand one more apple recipe? If you are like me you may still have a few apples around from the fall bounty. I made this Apple Crumb Pie a few weeks back and it reminded me of how much I like the simplicity of making a crumb topping pie! It also reminded me that I don’t always have to reinvent the wheel in the kitchen. There is a reason apple pie is an all-American favorite dessert through generations of cooks. My sous-chef dish-washing mom was just getting back to speed after 16 rounds of radiation treatment and the pie seemed to be just the right comfort food for her. I adore caramel pared with apple and so after preparing the pie according to the I found at allrecipes.com I drizzle a good bit of caramel ice cream topping before adding the crumb topping. The caramel added the nostalgic taste of caramel apple that I was looking for. 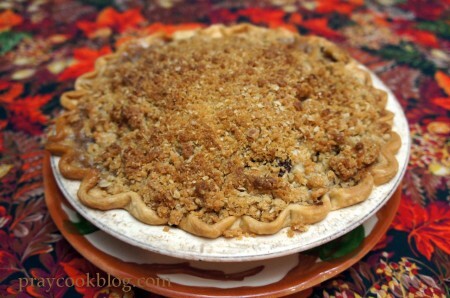 If you haven’t made a crumb pie lately, this just may be the day! P.S. It is our privilege, our right and our responsibility to vote in America. Be sure and make your voice heard today. An All-American Favorite cranked up a notch with a drizzle of caramel and a crumb topping. 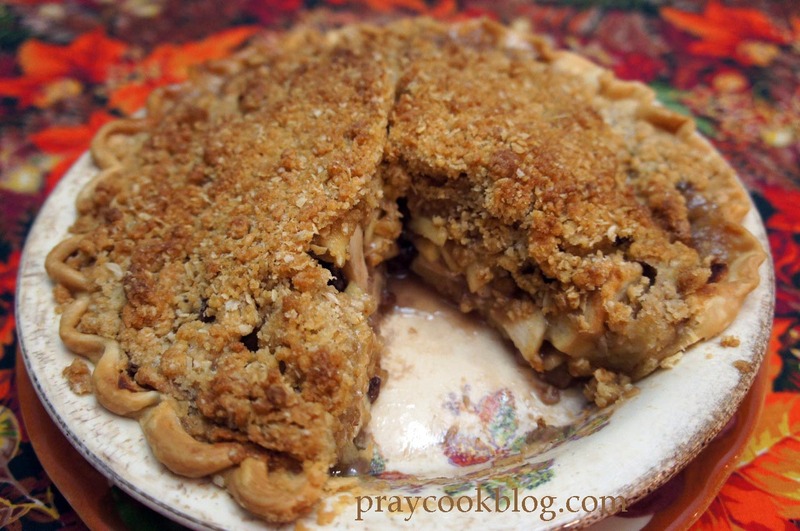 Easy to make and wonderfully comforting to eat! Prepare pastry shell into pie plate, fluting edges, if desired. Place sliced apples in a large bowl sprinkle with lemon juice. In a small bowl, mix together white sugar, 2 Tablespoons flour, cinnamon, and nutmeg. Sprinkle mixture over apples. Toss until apples are evenly coated. Stir in walnuts and raisins. Spoon mixture into prepared pastry shell. In a small bowl mix remaining ½ cup flour and brown sugar. Cut in butter until mixture is crumbly. 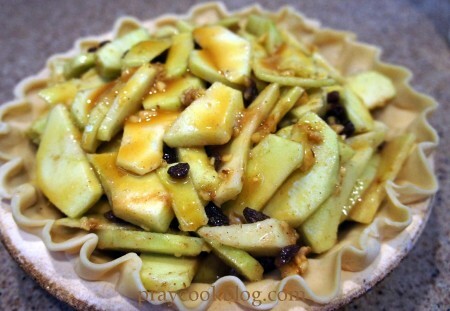 Sprinkle mixture over apple filling. Cover top loosely with aluminum foil. Bake in preheated oven for 25 minutes. Remove foil and bake and additional 25 minutes, until top is golden brown. Apples should be done but not squishy. 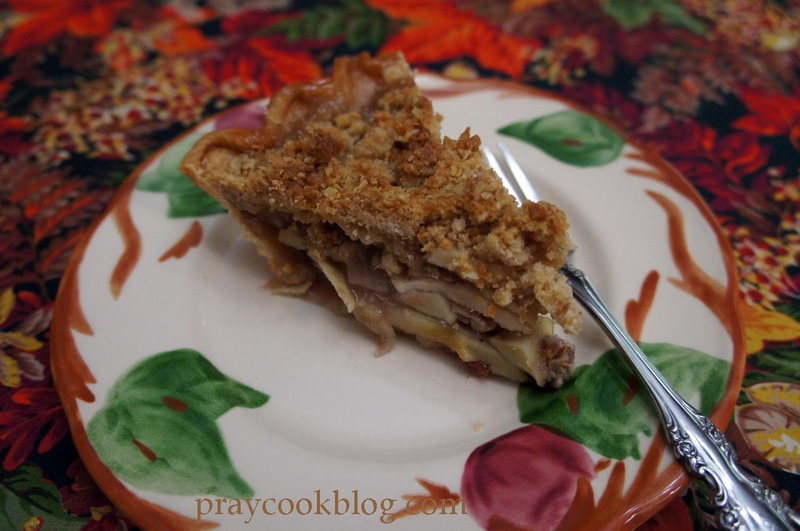 Granny Smith apples make a great pie, but you may use Fuji, Gala or your favorite baking apple as well.